What were you doing a year after high school ended? If you’re like most people, it was probably something inane and inconsequential. But Harsha Iyer is not like most people: oh, no. At all of 19 years old, the Chennai native has written, sung, performed, produced, and promoted 12 of the freshest songs that you will hear all year, on a startlingly good debut album called Curious Toys. Just a quick run through a couple of songs on the album makes one thing certain: Harsha’s like a musical 8-ball. Genres and styles shuffle past like T.V. channels under a teenager’s control of the remote, and it’s always just a guess where he takes you on the next song. Anxious, frenetic segments of electronica segue seamlessly into angsty almost-grunge, which soon transforms into jazzy chunks so energetic that they’ll make you sit up and take note. And as if his musical prowess is not promising enough, Mr. Iyer also proves to be quite the songwriter, adept at telling actual stories through his songs (as opposed to kitschy fragments of personal experience like most of his peers). But above all, it’s the confidence that surprises you. Harsha sounds so comfortable in his skin that on first listen, you’re almost sure that he’s ripping off a lot of artists: but it’s all original. Glitzy album opener ‘I Find You Boring’ tells us about the dreariness of a hapless girl who has tried to catch Harsha’s attention, but failed. True, the track is a little adolescent—“You can take me for a ride in your fancy flashy car/ You can tell me how you own and play Kurt Cobain’s guitar”—but there’s a certain spark, a certain joie in his voice that is just too infectious to turn your nose up at. ‘The Off Switch’, another stand-out, oozes with would-be rockstar swagger. Another good track is ‘On the Edge’, which sounds like a Trent Reznor B-side, both in its frenetic opening segment and in its vaguely suicidal lyrics (“The morning is a mystery every single time / Those wretched lousy sleeping pills don’t help me none“). To put it in understandable terms, it’s almost like the Dave Matthews Band and Pearl Jam had a baby in Chennai. However, Harsha really shines on the slower songs that show off his tunesmithery. ‘Not Yet Dead’ tells the chilling story of an old man awaiting his death, first with optimism and then with fatigue. The mysterious hint of violins, a certain operatic heaving, and bloodcurdling wails that make you almost shiver in awe: Harsha’s got it all on this song. 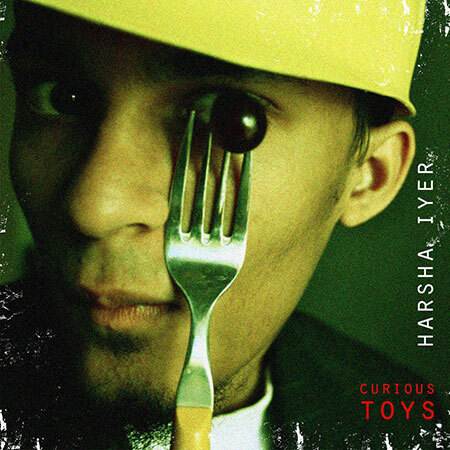 On the intriguing ‘Money’, Harsha uses clever lyrics to colourfully illustrate the story of a gold-digger con artist (“A minor you were, who would’ve thought / Eyes of innocence and a brain that’s smart / You had this plan to sue me all along”). ‘No Say’ is a hauntingly beautiful track, jangly guitar and echoing vocals merging elegantly with a strings section. With two stock characters (Tommy and Sally) and 10 lines of lyrics, Harsha Iyer somehow manages to tell a rendition of the timeless tale of unrequited love and bitter heartbreak. It’s one of the best songs here. The entire album is peppered with a certain lackadaisical charm, and nowhere is it more prevalent than on the radio-friendly ‘Overcautious’. This is the song that you play for your friends when they ask you what’s so great about the young singer. Harsha’s voice verves and weaves with unnatural skill and control amidst tight, lively instrumentation: ‘Overcautious’ almost sounds like a tune from a Something Relevant album. Doubtlessly, Curious Toys boasts of immense talent. However, Harsha still has his work cut out for him. Performing and producing all your songs is well and good, but most of the album sounds like it would benefit from a slightly denser production. Another spot of bother is Harsha’s contrived American accent. There’s actually an occasional swerve of Chennai in his voice, like a dollop of filter kaapi in a Starbucks espresso, which Harsha would be wise to capitalise on in future albums. All in all, Curious Toys is a highly surprising and enjoyable debut album, and you’d be smart to give it a spin. Click here to listen to and download Curious Toys for free.